If anyone has a character they’d like me to illustrate for a D&D game or something like that, please get in touch with me directly and we can organise something. I would have to charge a fee for it, which would depend on how detailed it was, whether it was black and white or coloured, etc. because it sometimes takes a long time, but I wouldn’t want anything too extortionate! We could maybe even work out some kind of exchange. Morgan the bard has been entranced by the ancient sagas from a young age. He always wanted to be involved in a great adventure himself and so he is psyched to have finally set out on a quest of his very own. What started out as a simple mission to borrow money from a neighbouring village has turned into an investigation into the murderous tribes of picts that have been terrorising local lands and rumours of the rise of the ancient black dragon Noak. Although Morgan is generally a cheerful guy and a spirited adventurer, he tends to see the world in very black and white terms, probably partly because of his small town upbringing and partly because he lives his life as if he were in one of the epic stories he grew up with, in which good and evil are very clear cut terms. 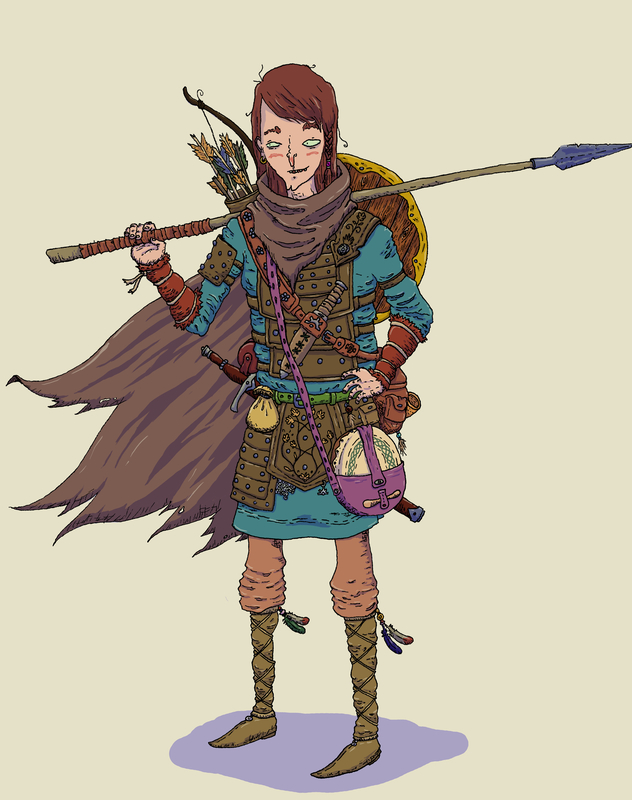 Morgan is my character in the weekly game of Pathfinder I’ve been playing for the past 4 weeks or so. He’s a bard, which means that he can recite rousing tales to boost him, and his allies, in battle and make them more powerful fighters, but he’s also a competent frontline warrior, and can even throw a few spells around when he needs to. Pathfinder is a tabletop roleplaying game (an adaptation of Dungeons & Dragons), which involves geeks sitting around a table, each with their own character with individual skills and unique powers, and another person, the games master (or dungeon master, depending on your preference), describing the scene, describing the situation, and then you working as a group to solve mysteries, battle monsters and undertake epic quests that can span weeks, months or even years. Most of it is carried out using the powers of your imagination and the things your characters can do are almost limitless (dependant on how powerful or wealthy your characters are). There are rules to the game and dice rolling is involved to determine the successes or failures of your actions but it’s mostly there to facilitate the smooth running of the game. This entry was posted in Chronicles of the Tales of the Sagas and tagged Adventure, Anglo-Saxon, animals, Arrow, Baggins, Bard, Beast, Bilbo, bodhrán, Bow, Cartoon, Celtic, Character, Cloak, Creepy, cute, D&D, Dirk, Dragon, Drake, Dungeons & Dragons, Dungeons and Dragons, Dwarf, Elf, Epic, Fantasy, Frodo, Gollum, Half-Elf, Halfling, Hero, Hobbit, Human, Leather, Leather Armour, Longspear, Longsword, magic, magick, Minstrel, monster, Morgan, nature, NPC, Pathfinder, PC, Quest, RPG, Samwise, scroll, Scroll Case, Skyrim, Spear, Studded Leather, Studded Leather Armour, Sword, Tolkien, Tunic, Viking, Willow. Bookmark the permalink.